Difference Between Doctorate and Ph.D.
• Categorized under Career & Education | Difference Between Doctorate and Ph.D. In the academe, both a doctorate and Ph.D. are common terms. However, people who live outside the education sector can confuse or mistake one concept for the other. Both a doctorate and a Ph.D. refer to the highest distinction and degree conferred upon an individual by an educational institution. The conferment of this type of educational attainment is carried out by a university. As the highest level, it is usually given after an individual accomplishes both a master’s degree and a bachelor’s degree. Both a doctorate and a Ph.D. focus on a single field of study or discipline. The main difference between a doctorate and a Ph.D. is in their respective meanings. A doctorate is an umbrella term for a degree or rank. On the other hand, a Ph.D. is a specific degree that falls under the doctorate category. A doctorate is a program that can result in either a professional or an academic degree. Doctorate studies focus on two main categories of discipline: research and professional. Holders of a doctorate degree are considered scholars and experts in their field of study. Meanwhile, a Ph.D., which stands for Doctor of Philosophy, is classified under academic degrees. Recipients of a Ph.D. also employ the same professional and scholarly characteristics of many doctorate recipients. However, Ph.D. degree recipients are more concerned with conducting research and have the necessary skillset to do so. Any kind of doctorate degree (including a Ph.D.) includes years of coursework, immense studies, and fieldwork. The final requirement for the degree is a dissertation, an original and documented paper that tackles a particular issue or problem in the discipline. However, the presentations of the final requirement are different. In many doctorate degrees, a dissertation is submitted for review and assessment. In a Ph.D., there is a dissertation defense as well as a publishing requirement. Publication of a Ph.D. dissertation requires that the document is publishable in a peer-reviewed academic journal. Doctorate degrees, especially professional degrees, are optional in many industries. However, people in the academe place a higher importance on this type of degree, particularly when it comes to a Ph.D. For many educators, a Ph.D. is a must; it is often required by universities among their teaching staff. A holder of a Ph.D. can be both an undergraduate and a graduate (master) student in their own discipline and is eligible for tenure. Doctorate degrees can be obtained in different areas of study and specialization such as law, education, medicine, engineering, or business. Doctorates can also be classified as traditional doctorate degrees (the student accomplishes all the requirements of the degree upon graduation) and the honorary degree (a person who is given the title of doctor due to their contribution to the field, study, or profession). Recipients of both types of doctorate are completely different. A recipient of an honorary degree is not necessarily capable of conducting research or contributing knowledge to a particular field. 1.Both a doctorate and a Ph.D. are degrees categorized as the highest level of educational attainment. Both are postgraduate studies that involve many years of education and contribution to the body of knowledge in a specific field. 2.Recipients of both degrees are expected to have expertise and immense knowledge in their chosen field. The ability to do research is another important skill. 3.The main difference between a doctorate and a Ph.D. (Doctor of Philosophy) is in their scope. 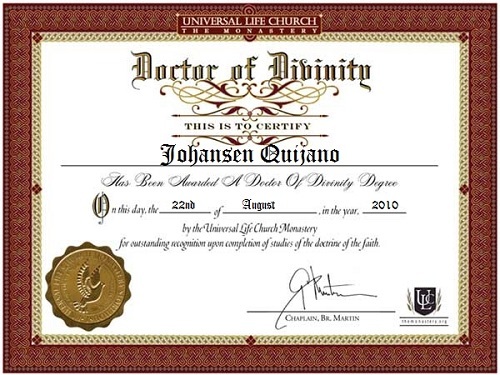 A doctorate can apply to any academic or professional degree. This includes various specific industries and professions like law, medicine, business, and engineering. On the other hand, a Ph.D. is a more defined degree. It falls under the academic degrees and concentrates more on research and teaching. 4.Another difference is in the presentation of the dissertation, the final requirement before the conferment of the degree. Doctoral dissertations usually involve research that is aligned with a certain profession or research orientation. The document is usually submitted for review or assessment. On the other hand, a Ph.D. dissertation is completely research inclined, must be defended to a panel, and should be publishable in a peer-reviewed journal. Difference Between MPhil and Ph.D. Difference Between J.D. and LL.M. Celine. "Difference Between Doctorate and Ph.D.." DifferenceBetween.net. July 28, 2017 < http://www.differencebetween.net/miscellaneous/career-education/difference-between-doctorate-and-ph-d/ >. This continually amazes me how blog owners for example yourself can find enough time and also the commitment to keep on composing excellent content. Your website isterrific and one of my own have to read personal blogs. I just had to say thanks. Now that I know the difference, I want to have the doctorate degree because I want to apply to other fields apart the engineering field on which I am now! It is worth noting that there is an additional distinction made of professional doctorates. As someone that trained overseas, in many countries these are not considered doctorates rather they are typically available as postgraduate bachelors degree. In effect a second degree. Law and Medicine and many others fall into this category and the US department of Education also states that the are a first degree in a field, which is a confusing state of affairs. Professional degrees in my opinion should be discontinued due to this confusion. Many professional societies also advise their members not to refer to themselves as Dr. In other parts of the world – and in times past in the US law degrees were called LLB’s, medical degrees MBBS (bachelor of Medicine / Bachelor of Surgery – 6 year double degree). As it stands right now I think it is fair for multiple degree holders to ask for professional doctorates – after all if you are not research and teaching capable you are hardly an expert.